If you understand what motivates people, you have at your command the most powerful tool for dealing with them to get them achieve extraordinary results. → Synergize the three greatest incentives: empower people to do the thing they enjoy doing; use various forms of recognition of people's contributions; provide financial and non-financial rewards. Motivation is getting others to do something because they want to do it. 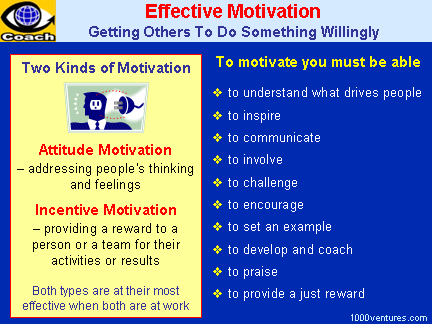 To motivate others is one of the most important management tasks. It comprises the abilities to understand what drives people, to communicate, to involve, to challenge, to encourage, to set an example, to develop and → coach, to obtain feedback, and to provide a just reward. Every person, including yourself, has a greater potential than they are exhibiting. As a leader, it's your responsibility to maximize their potential and performance and the results of each member of your team. → Creativeness often consists of turning on what is already there and helping a person to awaken his / her inner genius . Don't presume the the employees will stretch themselves to do what you wish for, hope for or beg for. A successful incentive program will not only increase profits but can also raise morale and inspire staff loyalty. Help the player to create and inspiring vision of how well he/she could perform. Reward idea generation. People want to know their ideas make a difference. To motivate your people, find the right fit for every person and help them grow!